Watermelons can be imposing. I mean, they’re huge! But they can be beaten. Imagine a fight between a watermelon and a pumpkin or even a jack o’ lantern; I think we all know who would win. 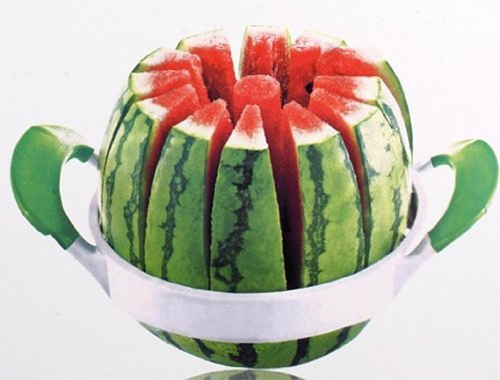 Take this Melon Cantaloupe Watermelon Stainless Steel Slicer Splitter for example: it is of the familiar push-down-to-slice variety, but huge enough to tackle a watermelon. Of course, just because it is a huge, gigantic slicer doesn’t mean it will work. It would appear a good deal of force is still necessary to push it through the great green monster — but at least it won’t be grinning at you mockingly while you try! ***UPDATE 9/9/15*** … and the watermelon wins! This thing is getting slammed in the reviews. About as hard as it must be to try to make this watermelon slicer actually work!